I have such a huge crush on this school! I would have written about it earlier, but I feel slightly embarrassed about how much I love it. hahaha. I have lots of friends whose lives embody the natural earthy style that this school represents, and while I grew up that way, since I’ve moved overseas this kind of lifestyle is harder to maintain (unless you are talking about my no shampoo or making your own coconut milk posts). I could see myself working here once I’ve paid off my student loans and I’ve already saved a good chunk for retirement because while the pay isn’t the best, I don’t think I would want to leave once I got there! Basically I think they wouldn’t think I’m cool enough to work there (at the moment), but just in case there are other people who are (and in case I get my coolness back one day), I wanted to write about the Green School’s awesomeness. I give this school a 9/10! On the school website it says there are more than 300 students from 45 countries. I found a blog that says each class has a max of “25 students with three teachers”. That sounds like an amazing ratio to me! The school handbook says that students are welcome to bring their own devices! They have solar panels too. I cannot find any details or mention of retirement funds. No point here. People don’t come to this school for the pay! I’m not sure where I read it (it certainly wasn’t on their website because there are no benefits listed there), but I have noted that the typical pay is $27k per year. I have also noted that they offer housing, settling in allowance, and an annual flight for expat teachers. I love the mix of the old and new on this island. It is tiny but there is a ton of culture packed in! 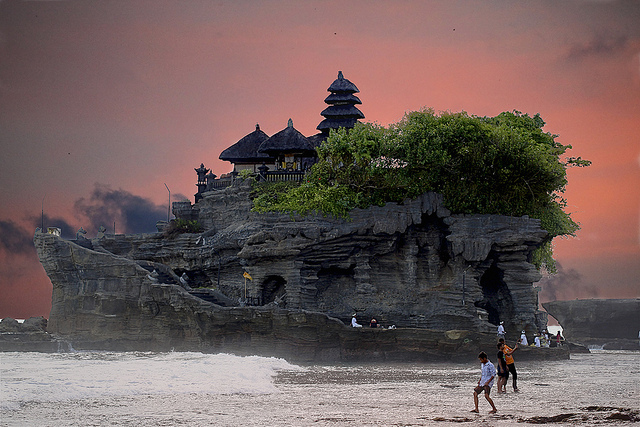 Beautiful beaches, temples, and dancing. Who would have thought your could find nightly salsa dancing on a small island?! This site lists 7 nights of salsa dancing per week AND LIVE MUSIC! They even specialize in Cuban Salsa which I love the most! Also, all of the staff is trained in Casino Rueda in case there aren’t enough dance partners! If I ever got tired of Cuban Salsa, I’m sure I would love to take some Balinese dance lessons too. I love tropical fruit, especially rambutans and mangos, and I even like durian. haha. Not to mention the curries, rice dishes, and Chinese food everywhere. It is a tourist spot so there are also many other options available. Please comment! Have you been to Bali? Would you want to work there? Have you or someone you know worked at the The Green School? Can you add any info to what I’ve listed above? Bali is on our list of places to go this year, I will let you know 😉 But seriously this school looks awesome! If you visit the Green School while you are there I hope you can share your thoughts with me. I’m so curious to see what people think once they are actually there. It sounds amazing! Thanks for featuring this school. It really is an amazing place for children to learn and be themselves. It does sound incredible! I would love to visit the school, even if I’m not cool enough to work here.